I love seeing little kids out and about, all dressed up like their favourite characters. It's so cute and I always said that anytime C wanted to go out in a costume, I'd let him. He was never really into costumes until World Book Day this year when he got his Jake & the Neverland Pirates one. Since then, I've bought him a Musketeers one as he loves the Mickey Mouse 'The Three Musketeers' movie and I will definitely be buying him a dressing up trunk for Christmas. Red Star Fancy Dress stock a wide range of costumes not only for children but for men and women and even accessories too. They even have 'Theme' and 'Occasion' tabs so if you have a stag do to go on or want to dress up with your other half in a couples costume, these are easy to find. Red Star Fancy Dress are very kindly giving my readers the chance to win a child's Harry Potter costume in the size of their choice. 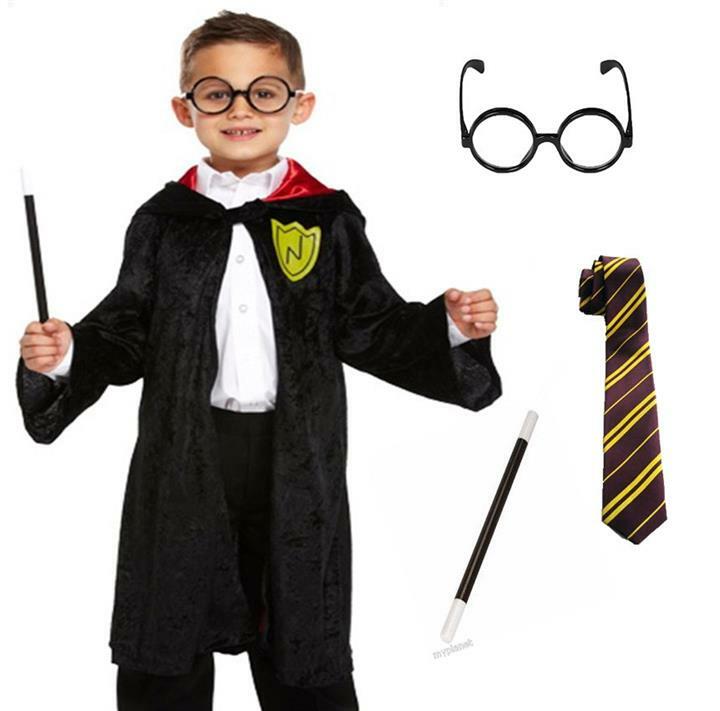 The costume includes a Soft Velvet Feel Robe, Neck Tie, Plastic Glasses with clear lenses and a Wizard Wand. It is available in sizes Small (4-6 years), Medium (7-9 years) and Large (10-12 years). 142 comments on "Win a Child's Harry Potter Costume"
I like the Roman Goddess Costume for girls. my favourite cosyume is the harry potter one, my daughter would love this!!! I love the PINK CHEERLEADER FANCY DRESS OUTFIT + POM POMS! I like the cat in the hat! I like the cheerleader ones. My daughter would like the Roman goddess one. The cheerleader outfits! Very cute! I like the Roman/Greek Goddess costume. I love Slash and Harry Potter, a strange combination, I know! Love the Harry Potter one! I love the harry Potter - so would my son, I also like the where's wally one. The Harry Potter outfit is great :-) My hubby is halfway through reading the second book to our two daughters, they are HP mad and I know they would love this to play with! Thanks! The marathon retro one is so funny! I like the kids Cat in the Hat things! what a great site for fancy dress etc. I have bookedmarked for future reference. The Harry Potter one is actually my favourite because we are all big fans! Love the Harry Potter outfit! Great! it has to be harry potter but I like the cat in the hat stuff to! I love the Where's Wally style outfit. I love the Harry Potter costume because i am a massive Potter fan! I actually like the Harry Potter one the best! Love the Harry Potter one, and I must say I do like the pink wig! Got to be the GIRLS ROMAN GREEK GODDESS OUTFIT as this is what my oldest is learning about at school. The Charleston Flapper outfit, is great.